Discussion in 'User Projects' started by karamble, Mar 9, 2016. 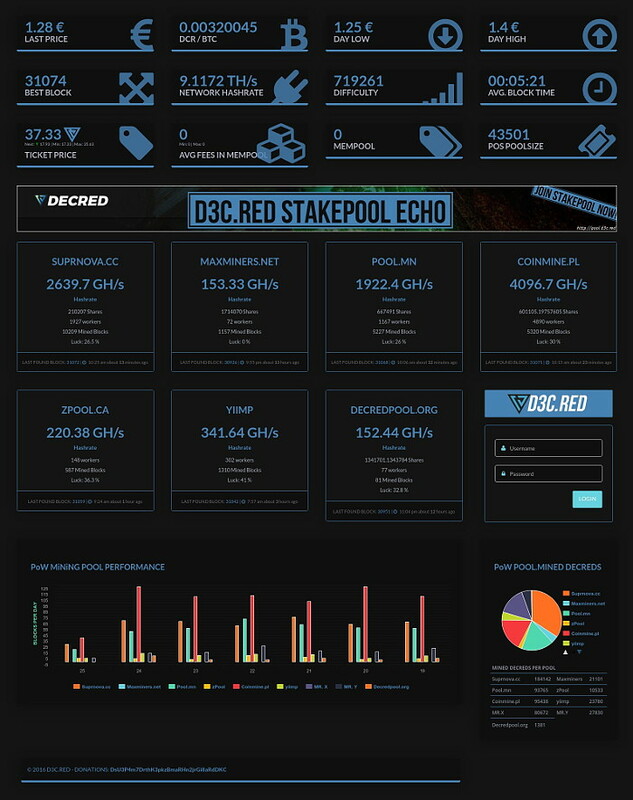 The Dashboard is especially focused on mining activities with high refresh rates on values which are important for mining decisions like the ticketmempool and exchange rates on bittrex. All data on the dash automatically updates. 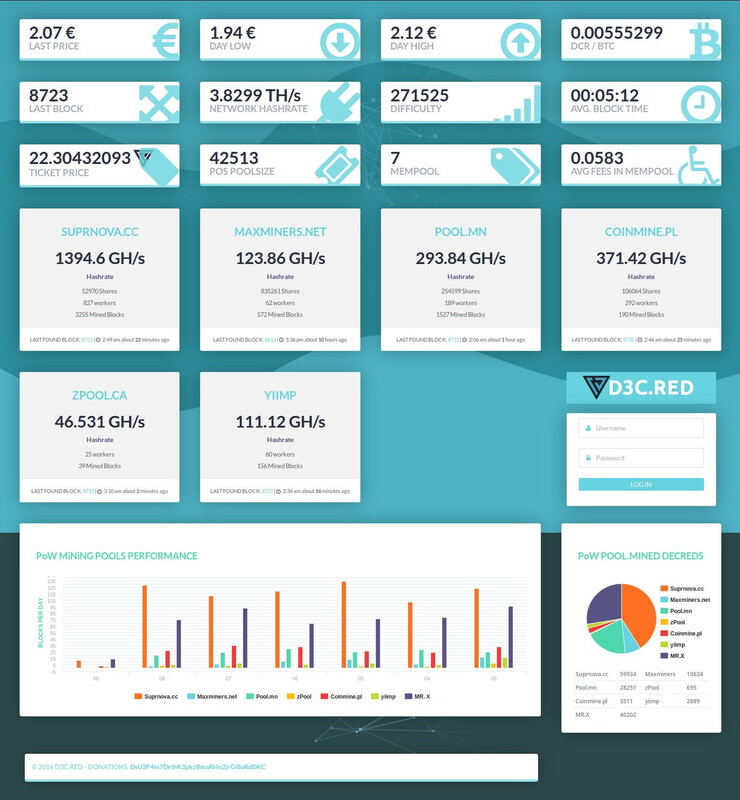 During the last weeks i tried to trace down PoW Mining activities on the network and you are able to see statistics of the various mining pools, like Blocks mined per day, and overall rewarded Decreds per Miningpool. Reynold, zero, jy-p and 12 others like this. I saw this a couple of days ago, looks snazzy. Question: Why is the "Fees in the mempool" pane using a wheelchair logo? I don't think it's offensive, just an interesting choice. I can see your thought process now that you've explained it. jy-p and David like this. In my oppinion Decred will have a great future, so i just wanted to make it a better place by spending some time and affords into this Project. The Project is still under development and new features are allready in the pipelines. If you have any suggestions feel free, i am allways open for new ideas, exchange of experience and of course... your donations! Awesome dashboard @karamble! I'm loving the background visuals when I move my cursor. Keep up the good work! Stopped by to suggest that you switch the pool performance graphics for one tracking efficiency/luck per pool over time. A large pool with the most blocks per day, might be the worst performer if all of it's blocks are found way above the respective average share count. Otherwise looking good, great job! The usefulness of that figure is marginal, however. Over time, the average "luck" of all pools should be within a marginal difference of each other. Obviously larger pools will have a smoother rate of return, but over a long period of time, you should get the same returns from any pool given the same hashrate and pool fee structure. I quite disagree with that logic @kaida . There's plenty of reasons why one pool might have a lower-than-expected performance/luck than others, and this is certainly an important factor in deciding which pool to use. I will not get into too many details on this here, but suffice to say, there's good pools and bad pools (and the same could be said of pool ops). The idea that average luck would tend to be the same for all pools, is based on the assumption that all aspects concerning efficiency are on par between the various pools. This is not always the case, and plenty times, the difference is quite substantial. And just like that, @karamble added a pool luck graph! Awesome! Edit: @kaida , see how there's some significant luck differences across pools? Will be interesting to see if these differences are long standing or just exceptions! Naturally, one must take into consideration that the largest pools will have less variance (so a smoother line), while smaller pools will have more variance (so a spikier line), but overall, we might see some very important trends! why have different numbers from dcrstats (( day low--day high e,t,c ))? The price of any crytocurrency keeps fluctuating. Day low- Is the lowest price of today and Day high - highest. What price do u wany? and what is last price different from? u take your stats from a different xchange then the stats of dcrstats ?